Last week, director Bryan Singer posted a new photo from the editing room of X-Men: Apocalypse, revealing that a teaser is "coming soon." Naturally, the director didn't offer a specific date as to when the first footage may arrive, which lead to speculation about what movie the trailer may be attached to. The Hunger Games: Mockingjay Part 2 was considered one candidate, since Jennifer Lawrence stars in both movies, but today producer Simon Kinberg confirmed to Collider that the trailer will actually be attached to prints of Star Wars: The Force Awakens, and that a new Deadpool trailer is also coming sometime next month. Here's what the producer had to say, revealing the X-Men: Apocalypse teaser will be longer than a minute. "I can in fact confirm that information. Our first trailer will be on Star Wars: The Force Awakens. It's our first thing out there so it is somewhat of a teaser but it's certainly longer than a minute and it has a ton of cool stuff in it." This news comes just a few weeks after another report claimed that Marvel's Captain America: Civil War will also debut its first trailer with Star Wars: The Force Awakens. What isn't clear, as of now, is if each of these trailers will debut online before or after Star Wars: The Force Awakens hits theaters, but we'll have to wait and see. Simon Kinberg also commented on the post-production process of X-Men: Apocalypse, teasing that they are working on the first cut of the sequel, calling it the biggest X-Men movie yet. "I'm super happy with it. We are in the edit working on it, working on the first cut of the film. But it's really exciting. I've said this before and I feel it even more having seen the movie cut together: I do think it will be the biggest of the X-Men films just in terms of the scale and the scope of the movie, and even more the emotional stakes and scope of the film. It has a level of drama and emotion, for all of the characters-I think going into it I assumed this would be the culmination in many ways of this little trilogy we were telling for young Erik, Charles, Mystique, and Beast but I think what was surprising over the span of photography and now into post as well is just how resonant the young Jean, Scott, and Storm stories are too. So I think the movie feels very balanced between-I don't wanna call them the older generation because they were the younger generation, but the generation of the X-Men from the last few films and the new generation." 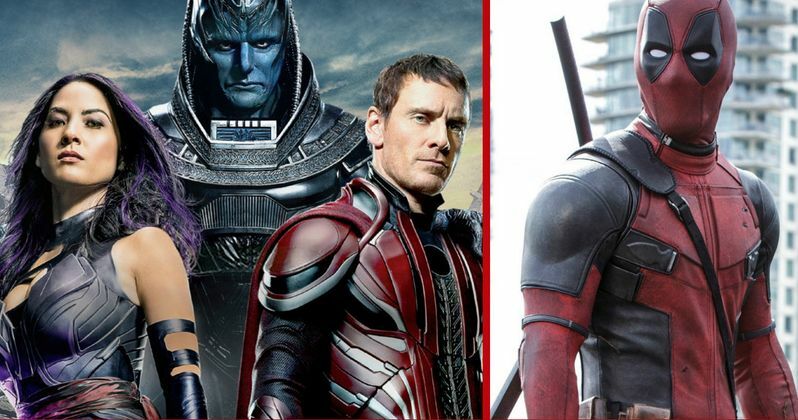 If trailers for X-Men: Apocalypse and Captain America: Civil War released in one month isn't enough, Simon Kinberg confirmed that the new Deadpool trailer is also coming out in December. Fans got their first look at this superhero in action with the red band trailer that arrived in August, but there certainly hasn't been a shortage of the Merc With the Mouth since then. Ryan Reynolds recently released a video of him trick-or-treating in his full Deadpool costume with a group of young mutants, and Simon Kinberg teased that we'll be seeing more from the actor very soon. "I've seen a version of the trailer that's pretty awesome, that's close to being ready. I think the plan is in December to put out the new trailer. In terms of new footage and material, Ryan's creating new footage and material every single day, so I'm assuming he'll do something new on the internet in the next week or so." Simon Kinberg also addressed how Deadpool fits into the X-Men universe. It has long been confirmed that Deadpool is part of the X-Men universe, but things have gotten slightly complicated with X-Men: Days of Future Past resetting the timeline. The producer revealed that Deadpool will acknowledge everything that has happened in this universe. "It takes place within the X-Men universe and references that universe. It's not the same time period as our past tense X-Men movies, like X-Men: First Class, X-Men: Days of Future Past, and X-Men: Apocalypse take place in the past and Deadpool takes place in the present, but it acknowledges everything that's happened in those other movies and the universe, and like you said Colossus is in it and other characters from the X-Men world." Since we've already seen footage from Deadpool before, are you looking forward to the X-Men: Apocalypse trailer more than the second Deadpool trailer? Or do you think the Captain America: Civil War footage will be more anticipated than the 20th Century Fox trailers? We'll find out in just a few short weeks, so stay tuned for more updates on all of these upcoming trailers.